Escaping into the calm of a hidden heaven. Peaceful, tranquil, and cut off from the world, Lake Birrabeen is a refuge inside a hideaway and my favouritest spot on Fraser Island. This place is mediation for the senses. Except for the few pesky horse flies that were emerging as summer approaches. At least twice the size of the hor sin (Hokkien for 'housefly') back in Singapore, the Australian ones are not just bigger, but deliver a painful and nasty bite that felt like tiny bee stings. Plus, they are persistent in their pursuit for a blood meal and rather hard to kill. I shudder to think when summer is in full swing to the buzz of hundreds of these biters. But the flies are only a minor bother worth putting up with for the smooth, pristine white sand and beautifully placid lakewater. 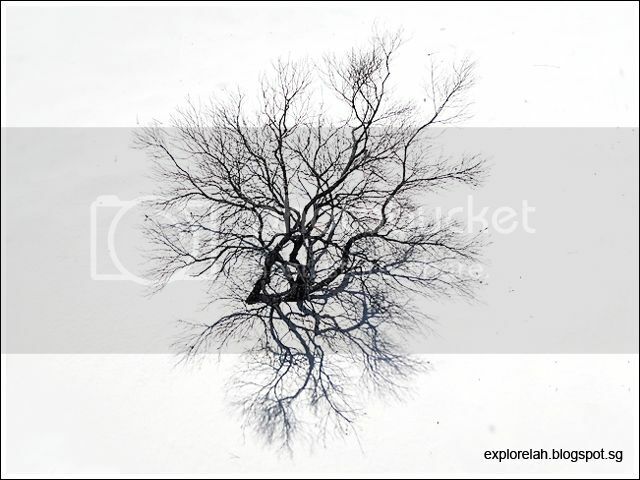 I'm jealous of this melaleuca tree which gets to enjoy this scenic lake everyday. 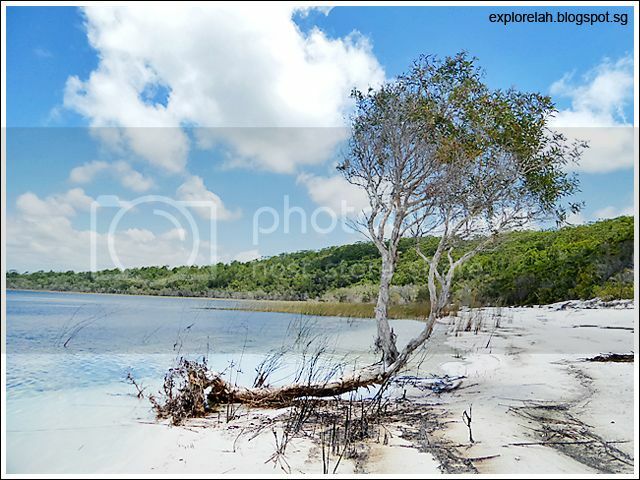 Fraser Island is home to around 100 natural lakes and depending on how they are formed, they can be grouped in one of 3 categories - perched lakes, barrage lakes, or window lakes. 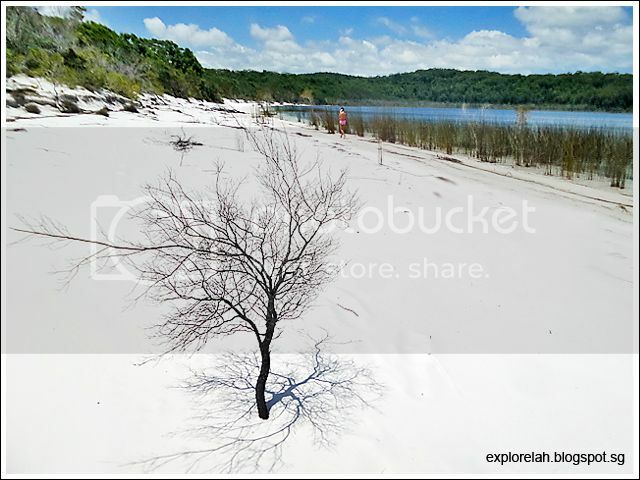 Lake Birrabeen belongs to the perched lake category which came into being when dead plant sediments line the bottom of a raised sand crater. The lining forms a waterproof layer beneath the crater that prevents rainwater that fell in from seeping through the sand. Over time, the collected rainwater forms a lake with no water getting in or out except through rainfall and evaporation. As these lakes sit higher than other terrestrial water bodies and aquifers found locally, they are classified as "perched". There are some 40 perched lakes concentrated on Fraser Island, which is half the number of such lakes known on our planet. 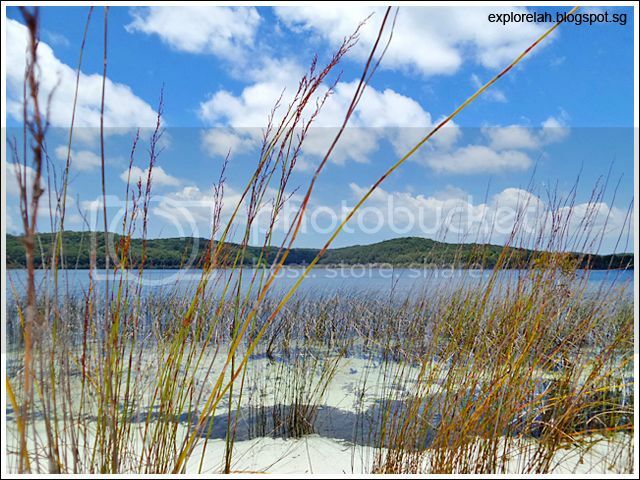 Panoramic view of Lake Birrabeen. 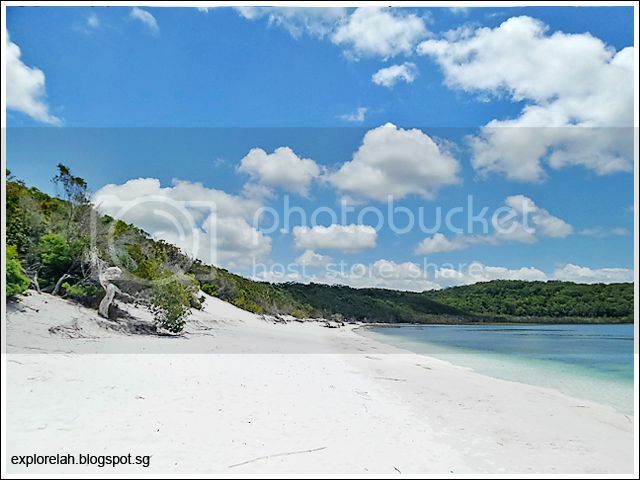 The most popular perched lake on Fraser Island is Lake McKenzie but Lake Birrabeen is equally stunning with the prized advantage of being a lot less crowded. Our visit on a late Monday morning met with only 3 other visitors. When they left, we had the whole lake to ourselves. As the water is slightly acidic, few aquatic species can survive in the lake which should ease the nerves of people with thalassophobia (fear of the thought and sight of creatures in deep waters). Didn't see any fish when I swam in the lake but the best thing to do is just sit by the pristine shore and let stress dissolve away. The lake beach is unbelievably white and clean. 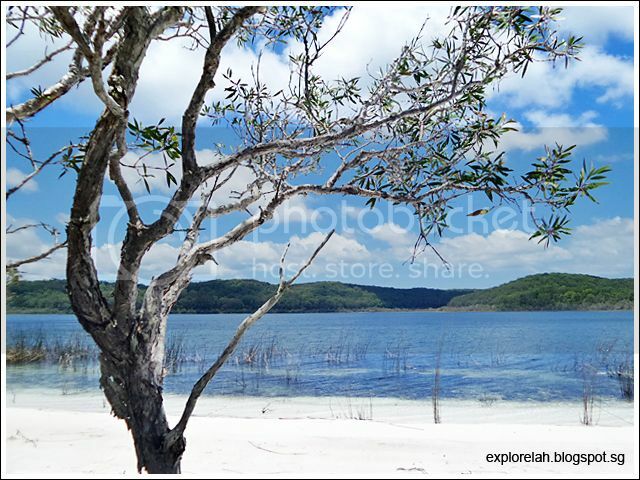 Lake Birrabeen is surrounded by eucalyptus and melaleuca trees (tea tree) which impart a slight hint of medicinal fragrance to the air. Numerous blackened shrubs stripped of leaves dot the shoreline masquerading as sea fans on a beach. 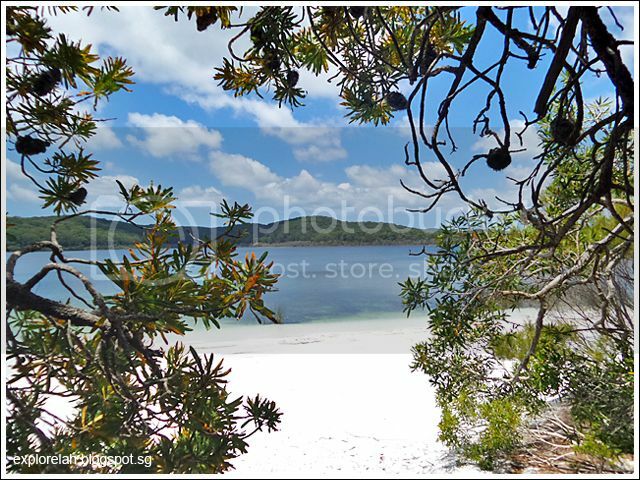 The bald and wiry shore side shrubs look very artistic against Lake Birrabeen's immaculate sand. Came across these miniscule brilliant red rosettes buttoned onto the shore like furry embroidered flowers. 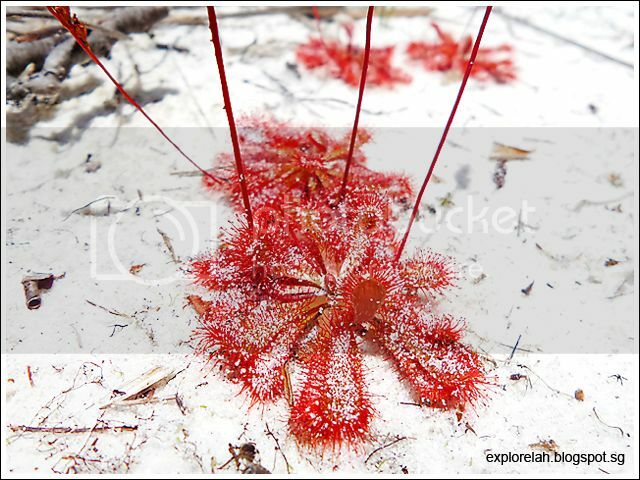 I think they are a species of sundews, a carnivorous plant native to Queensland that produces a sticky liquid at the tip of tentacles sprouting from fleshy leaves. Lethal beauty. Taking it slow is the way to go at Lake Birrabeen. Nature's beauty box... apparently, the water-steeped humus of eucalyptus and tea tree leaves (the black stuff in the water) has a refining effect on the skin. Rub it onto skin, leave for 15 minutes and wash it off with a swim. Awesome! Soaking in bliss that is at the level of divine! 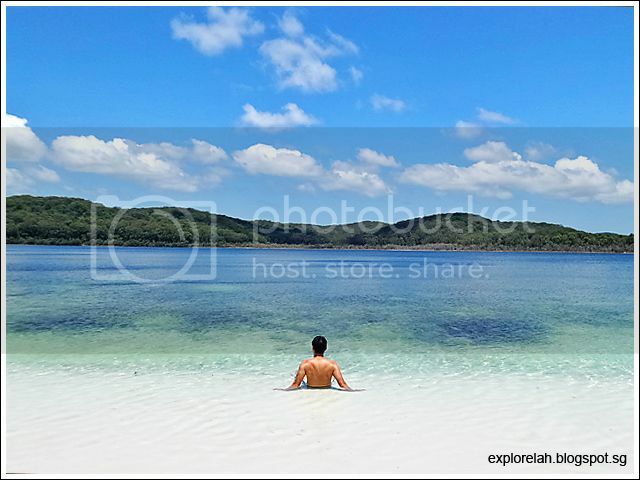 While most visitors to Fraser Island would head over to Lake McKenzie, our guide from Sunset Safaris decided to show us Lake Birrabeen instead. And just like that, one of my most memorable moments of the trip was born. Paradise does indeed reside on earth! This post has been made possible by Tourism Queensland Singapore and CTC Travel.